I love when I walk into the local grocery store and the cinnamon brooms are on display. They smell amazing and make it seem like fall even if the weather is still in the 80s here. Even though the brooms smell so good, I usually skip purchasing one because the smell seems to fade quickly. I wanted to come up with a way to reuse the broom to get more use out of it and this was one of those ideas that came together as well as I imagined it in my head. 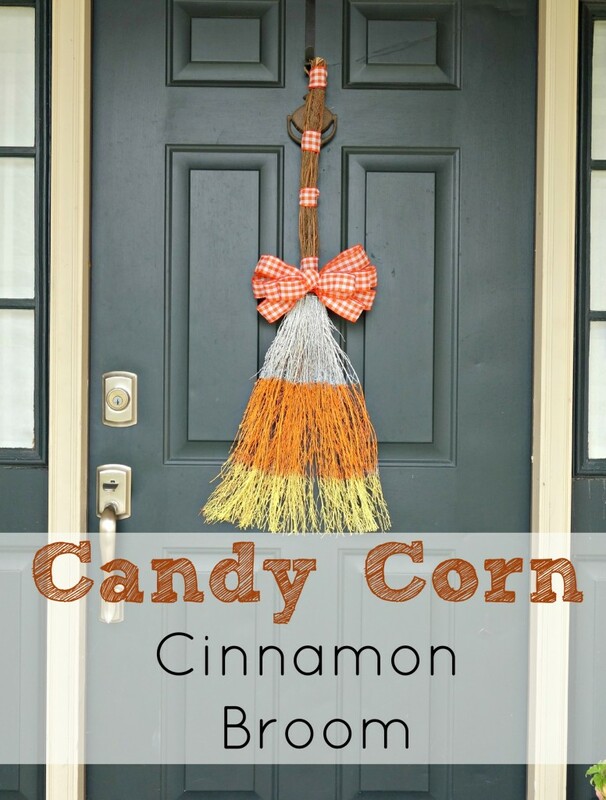 This candy corn cinnamon broom was a really easy nap time project that only took about 30 minutes, not including drying time. I used a new broom because I didn’t have an old one and didn’t want to wait for the smell to fade. 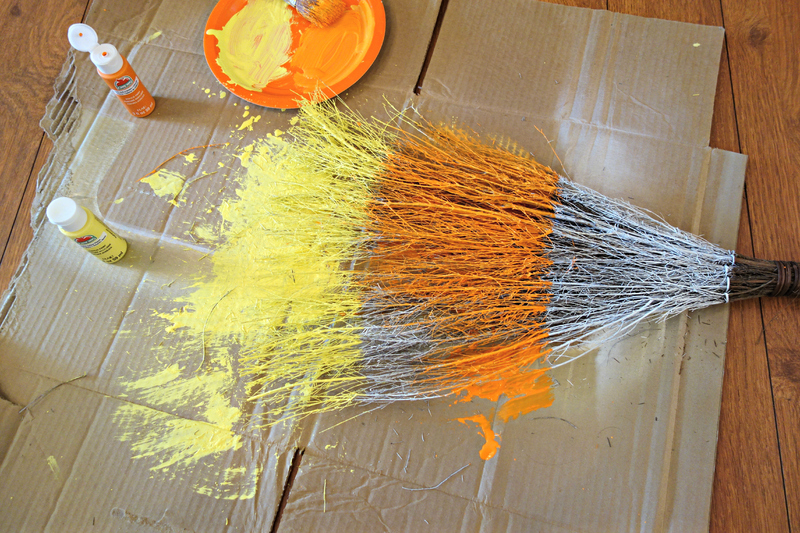 The broom actually still has a cinnamon smell even with the paint. I wanted to keep the broom handle unpainted so I used the bag the broom came in to protect the handle from excess spray paint. If you have an old broom you could just use grocery bags to protect the handle. Then I sprayed the entire broom with white spray paint, front and back. Painting the entire thing white will help the lighter colors look better later. I let the white paint dry overnight. To paint the candy corn stripes, I used cheap acrylic craft paint and a dry paint brush. I started by painting the yellow at the bottom. Make sure to really separate the bristles and get under the layers so that you get a solid coat all the way through. Then I painted the middle with orange paint using the same technique. 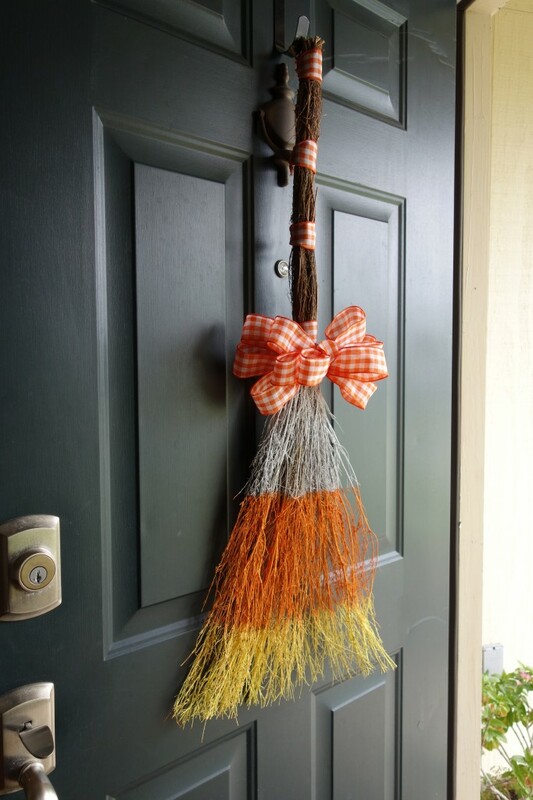 This candy corn broom was really easy but I did learn a few things. Learn from my mistakes. Spray painting the yellow and orange parts would have probably been easier, but I wanted to use what I had on hand. A sponge brush won’t work well. When you dry brush the stripes little bits of paint will splatter. I cleaned paint drops off of my floor, couch, and legs. After the paint was dry, I added some ribbon and a bow to the handle. I love my new fall door décor. Check out all DIY projects here.